In this study, lettuce roots and leaves were contaminated with enterohemorrhagic Escherichia coli O157:H− strain 431/97 under greenhouse conditions. Furthermore, the internalization of strain 431/97 in lettuce roots and leaves was examined. To track the inoculated bacteria during the experiments and to differentiate them from the autochthonous microbiota, a combined protocol including matrix-assisted laser desorption/ionization time of flight mass spectrometry (MALDI-TOF MS) and PCR was established. At different time points after inoculation of Batavia lettuce with 5.5 × 106 cfu/mL (high inoculation level) or 3.0 × 101 cfu/mL (low inoculation level) E. coli O157:H− strain 431/97 as well as sterile 0.9% (w/v) sodium chloride solution (negative control), samples from the root and the leaf were taken and surface disinfected with gentamicin. After homogenization, microorganisms were isolated from the samples and analyzed by MALDI-TOF MS. Analysis of the root samples resulted in bacterial counts of 1.0 × 102–1.0 × 106 cfu/0.25 g depending on the inoculated viable counts and the incubation period. In the leaf samples, strain 431/97 was not detected. The investigation of the viable cell counts of E. coli O157:H− 431/97 following irrigation of the leaves resulted in bacterial counts of 102 cfu/0.25 g for the disinfected leaf samples. Thus, the established protocol is suitable for detecting the investigated strain under greenhouse conditions in plant infection experiments. This strain may indeed survive in the soil, but did not enter the plant via the root in detectable numbers. Contrarily, viable counts exceeding the generally accepted infective dose of less than 100 cells for enterohemorrhagic E. coli were determined internalized after irrigation of the leaves. As this may pose a risk for the consumer, the present study provides a valuable set of tools for further research. Enterohemorrhagic Escherichia coli (EHEC) typically produces Shiga toxins (Stx), is able to form attaching and effacing lesions to epithelial cells and may carry large virulence plasmids [25, 31]. They may cause watery diarrhea and serious complications such as bloody diarrhea, hemorrhagic colitis and the hemolytic uremic syndrome in humans . These complications are caused by several toxins, such as Shiga toxin, cytolethal distending toxin V, enterohemolysin, and subtilase cytotoxin, as well as accessory virulence factors [24, 34]. Most outbreaks occurred by strains of the serotypes O157:H7 and O157:H−, as well as the non-O157 serotypes O26, O91, O103, O111, O118, O145 and O166 [6, 19, 20]. Contrary to other pathogens such as Salmonella and Listeria, the infective dose of EHEC is with less than 100 cells very low . The main reservoirs of EHEC are cattle and small ruminants, which remain asymptomatic . In the past, the ingestion of raw or undercooked animal products such as milk, cheese and meat was considered as the main route of transmission . More recently, plants which are consumed raw, such as lettuce and sprouts, were also identified to be of importance [10, 12, 16, 36]. Some of the largest EHEC outbreaks were associated with plants, such as the O157:H7 outbreak in Japan with radish sprouts in 1996 , the O157:H7 outbreak in the United States of America with spinach in 2006 , and the O104:H4 outbreak in Germany with fenugreek sprouts in 2011 , which was caused by a hybrid strain of enteroaggregative and enterohemorrhagic E. coli. EHEC may get in contact with plants via water, soil, where they were shown to survive for several months , manure (either applied on purpose as fertilizer or accidental contamination during flooding), wild animals, and insects . Additionally, E. coli is reported to be mobile in the plant . According to current knowledge, the plant itself is not only a carrier, but also its role as a secondary host for EHEC is discussed . EHEC strains get in contact with plant surfaces by adherence and adhesion, and can survive and multiply as an epiphyte on them . EHEC O157:H7 strain Sakai was shown to attach to and internalize into lamb’s lettuce roots under green-house conditions . EHEC may also integrate into already existing biofilms  on leaf surfaces as well as invade into the leaf via stomata  resulting in an endophytic lifestyle. Methods to trace specific microorganisms in the plant environment are basic to study the interaction of EHEC and plants in the presence of the autochthonous microbiota of the rhizo- and phyllosphere. 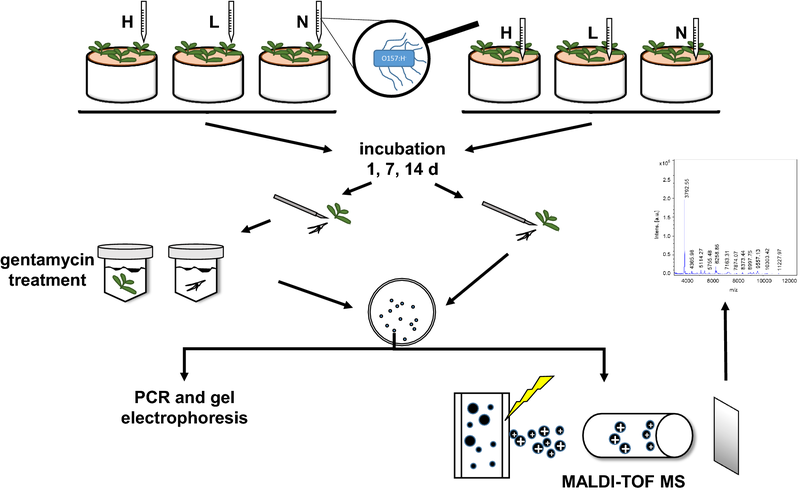 Therefore, a fast protocol combining MALDI-TOF MS with specific PCR to trace the selected E. coli O157:H− strain 431/97 during plant experiments under real-life conditions was established and successfully applied in this study. Shiga toxin-negative sorbitol-fermenting E. coli O157:H− strain 431/97 was used in this study. This strain was isolated from a 3-year-old child with watery diarrhea . It harbors the 121-kb-plasmid pSFO157 which encodes for several putative virulence loci, such as EHEC hemolysin (hly), type II secretion system proteins (etp), and Sfp fimbriae (sfp) . Three genes were used to differentiate this strain from other Enterobacteriaceae which might be present in the autochthonous microbiota of the soil or plant: the O157-antigen specific gene rfbE, which is positive in this strain, the sfpA gene, which is indicative for the presence of pSFO157, and the Shiga toxin 2a gene, which is absent in the strain 431/97. Thus, this strain has the genetic characteristics rfbE+, sfpA+ and stx 2 − . Overnight cultures of E. coli O157:H− 431/97 were grown at 37 °C on a shaker (160 rpm) in Luria–Bertani broth (Merck KGaA, Darmstadt, Germany) for the disinfection experiments, and in tryptone soy broth (Sigma-Aldrich Co., St. Louis, USA) for all other experiments. The optical density of the cultures was determined photometrically at 600 nm (OD600). The cells were harvested by centrifugation at 4 °C for 5 min at 10,225×g for disinfection experiments or 4500×g for all other experiments. The pellet was re-suspended in 0.9% (w/v) physiological sodium chloride solution (Carl Roth GmbH & Co. KG, Karlsruhe, Germany) to a standardized viable count. As reference strains for the PCR experiments, E. coli O157:H7 strain EDL 933 (rfbE+, sfpA−, stx 2 + ;  and E. coli laboratory strain DH5α (rfbE−, sfpA−, stx 2 − ) were used. For establishing of the disinfection procedures, commercial oak leaf lettuce purchased at a local supermarket was used. For all other experiments, Batavia lettuce of the cultivar Alanet (Enza Zaden Beheer B. V., Enkhuizen, The Netherlands) was grown in a biosafety level 2 greenhouse (Agroscope, Waedenswil, Switzerland) in natural field soil (sandy loam) under 16-h light and 8-h darkness conditions. The humidity in the greenhouse was 50%, the daytime (light) temperature was 22 °C and the nighttime (darkness) temperature 18 °C. Six 0.25 g samples of oak leaf lettuce were prepared by cutting the leaves with a sterile scalpel and weighing the pieces on an analytical scale. One sample remained untreated as a control. The other five samples were inoculated with 10 µL of a bacterial suspension containing 1.0 × 109 cfu/mL of strain 431/97 prepared as described above. The leaves were dried under a biosafety cabinet. Four of these samples were incubated in an aqueous solution with a final concentration of 50 µg/mL gentamicin (Carl Roth GmbH & Co. KG) for 1, 5, 10 or 20 min and then rinsed in 50-mL sterile demineralized water. The fifth sample was not treated. All samples were transferred to 2.25 mL of sterile 0.9% (w/v) sodium chloride solution and mixed on a vortex shaker at 100×g for 1 min. One mL of each of these suspensions was transferred into 20-mL modified trypticase soy broth (30 g/L trypticase soy broth (Becton, Dickinson and Company, Heidelberg, Germany), 1.5 g/L bile salts (Becton, Dickinson and Company), 1.5 g/L di-potassium hydrogen phosphate trihydrate (Merck KGaA); pH 7.4 ± 0.2) and incubated on a rotary shaker at 160 rpm under aerobic conditions at 37 °C over night. Bacterial growth was determined in a spectrophotometer as an increase in OD600 in comparison to the sterile broth. To investigate whether the gentamicin solution could be completely washed off from the samples, they were treated with gentamicin as described above for 5, 10 and 20 min. The treated samples were again transferred into physiological sodium chloride solution, blended, and a 1-mL aliquot was transferred into modified trypticase soy broth. To the remaining sodium chloride solution still containing the leaf, an E. coli O157:H− strain 431/97 solution with a viable count of 2.5 × 103 cfu/mL was added. The samples were mixed at 100×g with a shaker and incubated for 35 min at room temperature. They were treated further as described above, and additionally spread-plated on Fluorocult violet red bile agar (VRB-agar; Merck KGaA) and on plate count agar (PC-agar; 5 g/L tryptone (Becton, Dickinson and Company), 2.5 g/L yeast extract (Becton, Dickinson and Company), 1 g/L glucose (Merck KGaA), 12 g/L agar (Becton, Dickinson and Company); pH 7.0 ± 0.2). The plates were incubated at 37 °C for 24 h, and the viable counts were determined. The graphical abstract shows a flow diagram of the inoculation of plants as well as the subsequent analyses. Six trays of 7-day-old Batavia lettuce plants were used for the experiments. Two trays were watered with 200 mL of a suspension containing 5.5 × 106 cfu/mL (high inoculation level, H) E. coli O157:H− 431/97, two trays with 200 mL of a suspension containing 3.0 × 101 cfu/mL (low inoculation level, L) E. coli O157:H− 431/97, and two trays with 200 mL sterile 0.9% (w/v) sodium chloride solution (negative control, N). The suspensions were applied to the soil surface using a sterile 20-ml disposable plastic pipette, without contaminating the lettuce leaves. Samples were drawn 1, 7 and 14 days after the inoculation. After 14 days, lettuce plants reached a height of approximately 80 mm. The plants were carefully extracted from the soil, and cut with a sterile scalpel. Roots and leaves weigh less than 0.25 g per plant at this stage; thus, roots and leaves of several plants per tray were pooled to achive this mass. Therefore, they were transferred into a sterile petri dish. The leaves of one tray per treatment were disinfected with gentamicin for 10 min as described above, while the leaves of the second tray remained untreated. The disinfected leaves were rinsed twice with 40-mL demineralized sterile water. All plant samples were transferred into sterile mortars, and 2.25-mL sterile physiological sodium chloride solution was added to each sample. The plant tissue was ground, and the resulting solution was diluted decimally in physiological sodium chloride solution. Appropriate dilutions were spread-plated in duplicate on sorbitol Mac Conkey agar (SMAC, Merck KGaA), and the plates were incubated at 37 °C for 24 h. Sorbitol-fermenting bacteria, such as the investigated strain 431/97, metabolize this carbohydrate into acid, which in turn is used in combination with the indicator neutral red to turn the colonies red. Sorbitol-negative bacteria on the other hand, such as taxonomically closely related Shigella and Salmonella, show colorless colonies. The viable counts were determined and the colonies were assessed for their morphology. Selected colonies displaying different morphologies were sub-cultured on sorbitol Mac Conkey agar for purification, and assigned consecutive numbers. Six trays of 12-day-old Batavia lettuce plants were used for the experiments. The experimental setup was as described above, but this time the bacterial suspension or the sodium chloride solution was dispersed over the plant leaves and left to dry until the first sampling on the next day. Plant leaf samples were drawn and analyzed as described above. As a basis for further analysis, a main spectrum (MSP) of E. coli O157:H− strain 431/97 was generated using the MALDI-TOF mass spectrometer ultrafleXtreme (Bruker Daltonics GmbH, Bremen, Germany) from 12 spectra of this strain with the MALDI Biotyper 3.0 software, using the Biotyper MSP Creation Standard Method. The maximum quantity error of each spectrum was set to 2000 ppm, and of the main spectrum to 200 ppm. For the main spectrum, the minimum peak frequency was set to 25%, and the maximum number of peaks to 70. This main spectrum was included into the MALDI Biotyper 3.0-Database as Escherichia coli 431_97_drd (Bruker Daltonics GmbH). Colonies were chosen from the agar plates of the internalization experiments for subsequent analysis. Sixteen isolates were chosen which displayed the same morphology on plate as the investigated E. coli O157:H− 431/97 strain, and 15 isolates which displayed a different morphology and were, therefore, considered as members of the autochthonous microbiota. The putative E. coli isolates originated from the experiments described in Table 1 (see “Results” section), whereas the origin of the putative autochthonous microbiota isolates is shown in Table 2 (see “Results” section). Colony material of the pure cultures prepared as described above was transferred in duplicate onto spots of the MALDI-TOF MS target (MTP ground steel, Bruker Daltonics GmbH) with sterile tooth-picks. Eight spots per target were loaded with E. coli O157:H− 431/97 as a reference. The bacteria were inactivated with 0.8 µL 70% formic acid per spot. To the dried spots, 0.8 µL matrix solution (10 mg α-cyano-4-hydroxycinnamic acid (Bruker Daltonics GmbH) dissolved in 1 mL 50% acetonitrile/2.5% trifluoroacetic acid solution) was added, and this solution was air-dried. The plates were stored in the dark in sterile containers under argon atmosphere at room temperature. Prior to analysis, a bacterial test standard (BTS, Bruker Daltonics GmbH) covering a mass range from 3.6 to 17 kDa was added to selected spots (for detailed protein masses see ). Sum spectra were generated from samples after 1200 laser shots per sample at 1000-Hz frequency in the positive linear mode in mass–charge (m/z) ratios ranging from 2000 to 20,000 Da. Baseline subtraction and smoothing of the spectra was performed with the MALDI flexAnalysis 3.4 software (Bruker Daltonics GmbH). Peak lists were generated for the spectra with the Biotyper 3.0 software (Bruker Daltonics GmbH), with the parameters of a minimal intensity of 1% of the highest peak and a maximum number of 100 peaks. The results were expressed as score values, where a value of 2.3–3.0 indicates a definite identification at species level, and a value of 2.0–2.299 possible identification at species level. Score values of 1.7–1.999 indicate identification at genus level, while values below 1.699 allow no phylogenetic assignment. Colony material of the same strains applied for MALDI-TOF MS analysis as well as the reference strains E. coli O157:H− 431/97, E. coli O157:H7 EDL 933 and E. coli DH5α was streaked onto Luria–Bertani agar (tryptone 10.0 g/L, yeast extract 5.0 g/L, agar 15.0 g/L, all Becton–Dickinson GmbH, Heidelberg, Germany; sodium chloride 10.0 g/L, Carl Roth GmbH & Co. KG; pH: 7.0 ± 0.2 at 25 °C) and incubated at 37 °C for 24 h. Pure strains were sub-cultured in Luria–Bertani broth. Biomass of 1.5-mL broth was harvested by centrifugation at 4 °C and 13,000×g for 10 min and genomic DNA was isolated with the Illustra Bacteria Genomic Prep Mini Spin Kit (GE Healthcare GmbH, Solingen, Germany) according to the manufacturer’s instructions. DNA concentration and quality were assessed with a NanoDrop 2000 UV/Vis-spectrophotometer (Thermo Fisher Scientific Inc., Waltham, USA). PCR reactions with a total volume of 25 µL contained 2.5 µL 10× buffer S with 15 mM MgCl2, 0.5 µL dNTP-mix (10 mM each), 0.5 µL Taq DNA-polymerase (5 U/µL; all Genaxxon Bioscience GmbH, Ulm, Germany), 18.5 µL sterile DNase- and RNAse-free water (Thermo Fisher Scientific Inc.) as well as 1.0 µL of each primer (10 pmol/µL; synthesized by Eurofins MWG Operon, Ebersberg, Germany) per primer-pair described below. 1 µL of the genomic DNA was used as template. Three genes were chosen for the identification of the applied strains: rfbE, as this gene is specific for members of the serogroup O157, the sfpA gene, as it is encoded on the pSFO157 plasmid, and the Shiga toxin stx2a gene, which should be absent in the strain O157:H− 431/97. For all PCR reactions, the strains E. coli O157:H− 431/97, E. coli O157:H7 EDL 933 and E. coli DH5α as well as sterile water were used as positive and negative controls, respectively. The rfbE gene was partially amplified with the primer-pair rfbE-f (5′-CGG ACA TCC ATG TGA TAT GG-3′) and rfbE-rv (5′-TTG CCT ATG TAC AGC TAA TCC-3′) (Paton and Paton , the sfpA gene with the primer-pair sfpA-U (5′-AGC CAA GGC CAA GGG ATT ATT A-3′) and sfpA-L (5′-TTA GCA ACA GCA GTG AAG TCT C-3′)  and the stx2a gene with the primer-pair LP 43 (5′-ATC CTA TTC CCG GGA GTT TAC G-3′) and LP 44 (5′-GCG TCA TCG TAT ACA CAG GAG C-3′) . All amplifications were carried out in a thermocycler T1 (Biometra GmbH, Göttingen, Germany). For rfbE, after an initial denaturation at 95 °C for 4 min, 35 cycles of 1 min at 95 °C, 2 min at 65 °C and 1.5 min at 72 °C were performed. The final extension was for 4 min at 72 °C. The expected amplicon size was 259 bp. For sfpA, after an initial denaturation at 94 °C for 5 min, 30 cycles of 0.5 min at 94 °C, 1 min at 61 °C and 1 min at 72 °C were performed. The final extension was for 5 min at 72 °C. The expected amplicon size was 440 bp. For stx2a, after an initial denaturation at 94 °C for 5 min, 30 cycles of 0.5 min at 94 °C, 1 min at 58 °C and 1 min at 72 °C were performed. The final extension was for 10 min at 72 °C. The expected amplicon size was 584 bp. All PCR products were separated in 2% (w/v) agarose gels and visualized by ethidium bromide staining under UV-light (302 nm). GeneRuler 100 bp DNA ladder (Thermo Fisher Scientific Inc.) was used as a reference. For detecting internalized E. coli O157:H− 431/97 cells, a surface disinfection protocol with gentamicin was established to effectively remove adhering bacteria from the plant surface to avoid false-positive results. Lettuce leaves artificially contaminated with E. coli O157:H− 431/97 were treated with 50 µg/mL gentamicin for up to 20 min. For the negative control without gentamicin treatment as well as for the treatments for 1 and 5 min, bacterial growth was observed. Longer treatment periods of 10 and 20 min inhibited bacterial growth, as the optical densities were equivalent to the un-inoculated medium control (10 min: increase in OD600 0.0009 ± 0.0001; 20 min: increase in OD600 0.0050 ± 0.0002). One aim of this study was to analyze bacteria that were not freely available on the leaf surface, because they, for example, entered stomata or were internalized into the plant tissue. Gentamicin residues on the leaf surface might inhibit the growth of these bacteria when they were set free in sample preparation, and, thus, affect the subsequent viable count results. To investigate this possible effect, the leaves were contaminated with E. coli O157:H− 431/97 as described above. After gentamicin treatment, the leaves were rinsed in physiological sodium chloride solution. 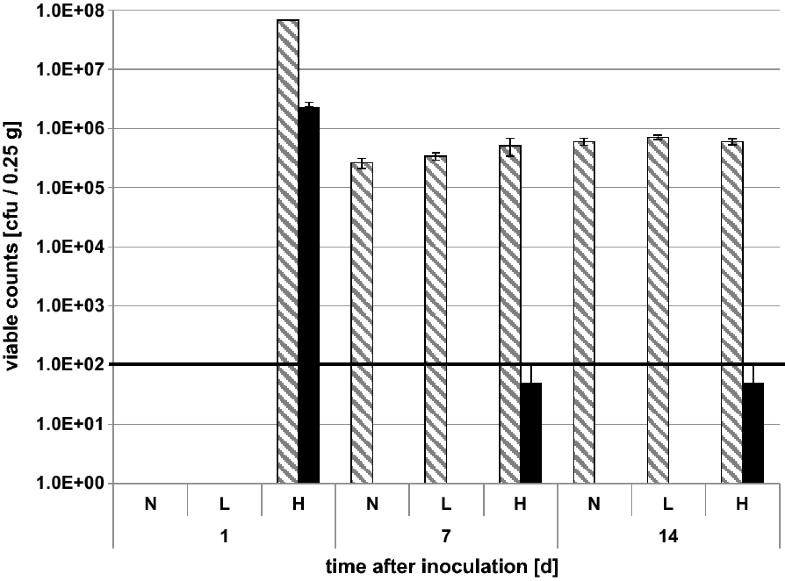 These solutions of both controls, the native non-disinfected leaves and the negative control, showed the respective expected positive and negative results in modified trypticase soy broth (data not shown). For the gentamicin-treated leaves, no growth was determined, confirming the above results. Consecutively, the sodium chloride solutions obtained from disinfected leaves were inoculated with low numbers of E. coli O157:H− 431/97 to determine a possible antimicrobial effect. 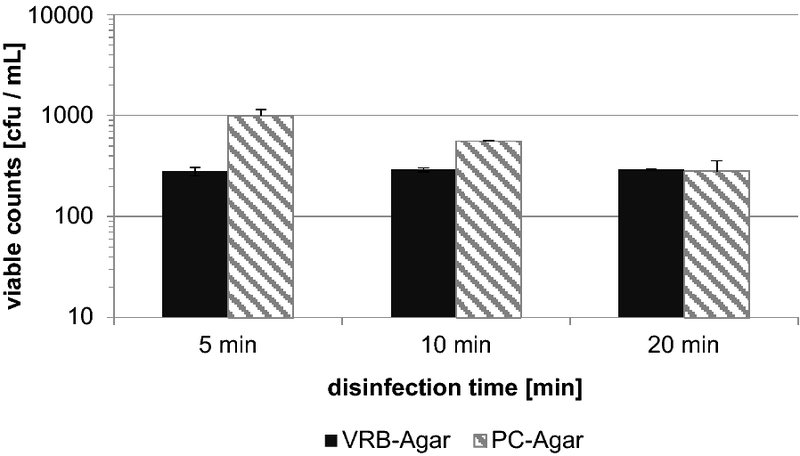 The counts on VRB-agar remained constant at 2.8 × 102–2.9 × 102 cfu/mL (Fig. 1), while as expected slightly higher counts of 2.8 × 102–1.0 × 103 cfu/mL were detected on PC-agar (Fig. 1). 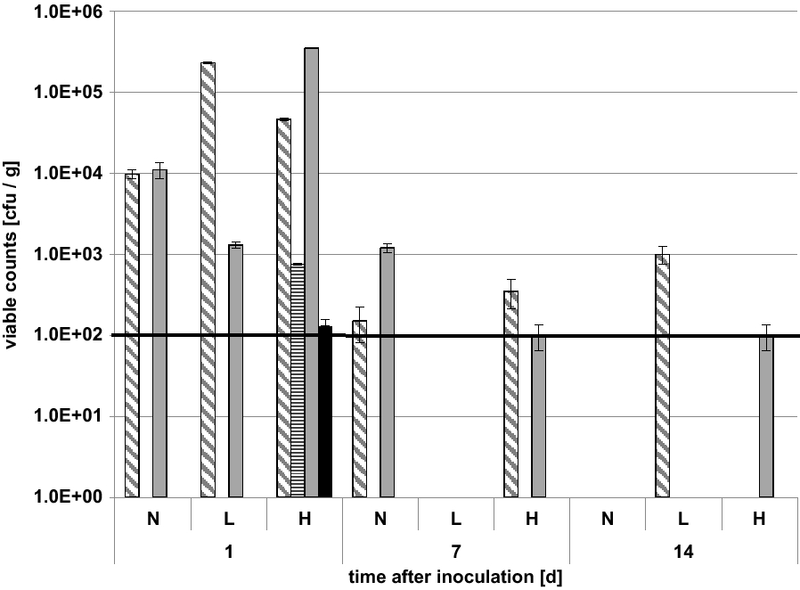 After inoculation of the soil of lettuce plants with high (H; 5.5 × 106 cfu/mL) or low (L; 3.0 × 101 cfu/mL) amounts of E. coli O157:H− 431/97, the plants were grown for up to 2 weeks. Samples of roots with adhering soil as well as leaves were prepared as described above after 1, 7 and 14 days and streaked on SMAC agar. The colonies on SMAC agar were visually distinguished in potential EHEC colonies (red color) and autochthonous microbiota (colorless), and were evaluated separately. The rhizosphere samples were analyzed without prior treatment. One day after the inoculation, the viable counts of the autochthonous microbiota on SMAC agar ranged at about 108 cfu/g root (Fig. 2). The counts of samples N and L at day 1 could not be evaluated due to too high viable counts. These counts declined by approximately two log units within the first week, and remained stable thereafter for the experimental period. The inoculated E. coli O157:H− strain 431/97 was only detected in rhizosphere samples which were inoculated with high doses of this strain. One day after inoculation, the EHEC counts were 9.2 × 106 cfu/g root with adhering rhizosphere. These counts dropped significantly to 5.0 × 101 cfu/g during the first week, and remained stable thereafter (Fig. 2). The leaf samples were evaluated after treatment with gentamicin. While an autochthonous microbiota was detected in the range of 104–105 cfu/g leaf, no EHEC cells were found (data not shown). Lettuce plants were inoculated on their leaves with high (H; 2.3 × 106 cfu/mL) or low (L; 3.0 × 101 cfu/mL) doses of E. coli O157:H− strain 431/97, and grown for up to 2 weeks. The leaves were either analyzed as such or treated with gentamicin prior to viable count analysis. Without disinfection, the viable counts of the leaves ranged as expected between 1.4 × 103 and 4.3 × 105 cfu/0.25 g leaf 1 day after contamination. Subsequently, the viable counts ranged from below the detection limit (1.0 × 102 cfu/0.25 g leaf) to 2.0 × 103 cfu/0.25 g leaf (Fig. 3). 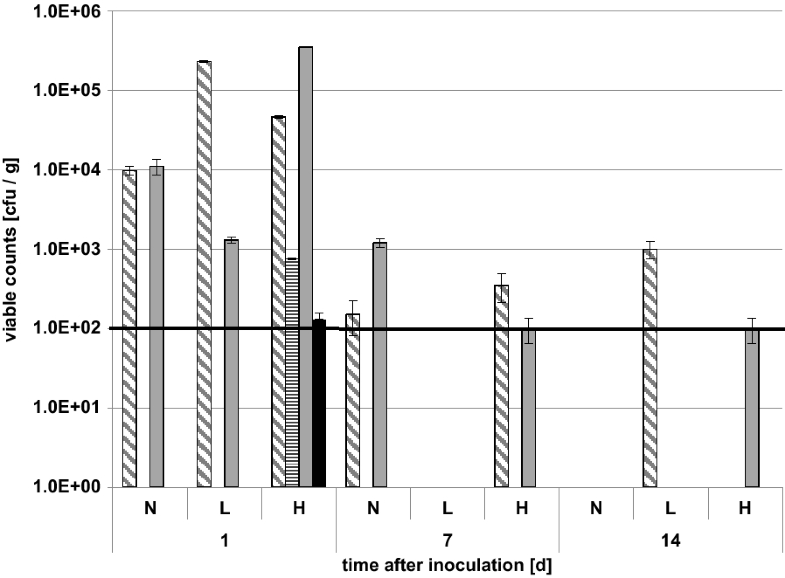 In the disinfected leaf samples, the viable counts on SMAC agar were between 1.0 × 102 and 3.4 × 105 cfu/0.25 g leaf 1 day after contamination, and decreased over the incubation period (Fig. 3). One day post contamination, the EHEC strain was detected both in the non-disinfected and in the disinfected leaf sample initially inoculated with the high EHEC dose. The EHEC counts of the non-disinfected sample were approximately six times higher than those of the disinfected sample. After 7 days of incubation, one non-disinfected leaf sample was positive for EHEC with 7.5 × 101 cfu/0.25 g leaf, but below the quantification limit. Altogether, 31 isolates were selected on account of their colony morphology as putative E. coli for subsequent PCR- and MALDI-TOF analysis. Sometimes, more than one colony per plate was chosen and denominated with a suffix. The expected results for the PCR for E. coli O157:H− 431/97 were rfbE+, sfpA+, and stx 2a − (for gel pictures see Additional file 3). 15 of the 31 isolates yielded no amplicons in all three PCR assays, thus being not the investigated E. coli strain, and were, therefore, discarded from further analysis. Of the 16 remaining potential EHEC colonies, 14 were identified as E. coli by MALDI-TOF analysis with score values between 2.3 and 3.0, indicating a definite identification at species level (see Table 1). The two remaining isolates were identified with score values of 2.226 (isolate 294 1) and 2.234 (isolate 289), respectively, which corresponds to a possible identification at species level (Table 1). For all strains, the correct profile of E. coli O157:H− strain 431/97 was the top hit of the results list (see tables S1 to S16 in Additional file 1). The peak lists and the mass spectra of all strains are given in Additional file 2. These results were complemented by PCR targeting the rfbE, stx2a and sfpA genes (see figures S17 to S22 in Additional file 3) confirming the strain identity. 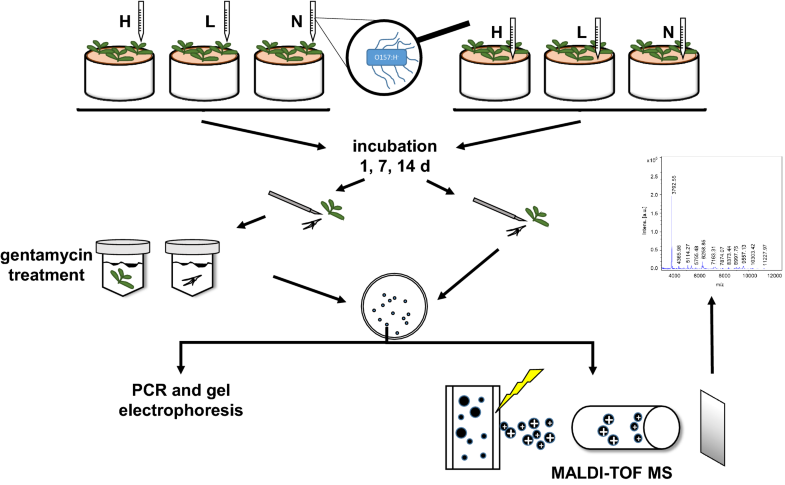 From the isolates of the autochthonous microbiota of the rhizo- and phyllosphere, 15 colonies were chosen for MALDI biotyping. The results of the top hits for each strain are displayed in Table 2. The peak lists and the mass spectra of all strains are given in Additional file 2. For 13 strains, MALDI biotyping provided a possible identification at species level, while two strains were identified at the genus level only. The dominant genus was Pseudomonas with six isolates, followed by Achromobacter with three. The other genera were identified only once each. Some of the largest EHEC outbreaks have been associated with plant foods such as leafy greens and sprouts. To investigate the interaction of EHEC with plants, fast and reliable methods for tracing EHEC in plant experiments under greenhouse conditions in the presence of the autochthonous microbiota are needed. Furthermore, viable and dead EHEC cells should be differentiated. Several microbiological and molecular biological methods have been applied for this task so far (for a review see ): quantitative real-time PCR (qPCR) targeting diverse genes (e.g., ), fluorescence in situ hybridization (FISH; e.g., ), the application of reporter genes such as lux (e.g., ), immunofluorescence (e.g., ), as well as the microscopic detection of bacteria expressing fluorescent proteins, such as green fluorescent protein (e.g., ). All these methods have to overcome one or another obstacle, such as PCR inhibitors present in the plant environment, autofluorescence of non-bacterial particles, low expression levels of reporter genes or varying stability and expression of genes encoding fluorescent proteins under experimental conditions, thus hampering reliable detection in the presence of the autochthonous microbiota. On the other hand, Ojima-Kato et al. reported that MALDI-TOF MS may successfully discriminate between the E. coli serovars O157, O26 and O111 and other E. coli serovars regardless of the cultivation conditions. Christner et al. even reported that MALDI-TOF MS was capable of tracing the E. coli O104:H4 outbreak strain of 2011 in stool, rectal swab and urine isolates. This gave the impetus for the establishment and examination of a complementary MALDI biotyping protocol combined with specific PCR for tracing EHEC in the plant environment. The results of the current study show that the established protocol reliably traces E. coli O157:H− 431/97 in in vivo plant experiments. The investigated strain was already differentiated from the autochthonous microbiota as well as closely related pathogens such as Salmonella and Shigella on SMAC agar by its ability to metabolize sorbitol. This is not the case for other EHEC strains, which are incapable of sorbitol degradation and might, therefore, be misidentified. Therefore, a subsequent identification procedure as presented in this study is essential. Thus, the unique protein profile of the strain in question was integrated into the MALDI biotyping database. The mass peaks at mass/charge ratios of 3791.7, 3814.0, 3830.4, 6257.1, and 9742.8 can be considered as marker mass peaks for this strain. The putative E. coli O157:H− 431/97 colonies matched the deposited profile in the MALDI biotyping database and each time this was the top hit. This could be due to the fact that pathogenic E. coli contains an extensive accessory gene pool and that the E. coli core genome was found to consist of only 3100 genes, while the accessory genome was estimated to include up to 89,000 genes . As already proposed by Christner et al. , this method is indeed applicable for strain-typing in environments containing different strains and species, such as, in the current study, the microbiota of the phyllo- and rhizosphere. The MALDI-TOF MS results were furthermore confirmed by complementary PCR in this study. From these experiments, it was concluded that the investigated strain E. coli O157:H− 431/97 may survive in the soil, but did not enter the plant via the root in significant numbers. Contrarily, the main route of entry into lettuce plants might indeed be over the leaves, which also constitute the edible part of the plant. It has to be noted that the adherence of E. coli to plants and its internalization is a complex process depending, amongst others, on the investigated strain, the plant (cultivar, age, health status), the cultivation conditions and the soil . Unfortunately, this process is still poorly understood and the interaction of EHEC with the plant should be investigated further. The methods described in this study pose a valuable basis for subsequent research. In this study, a MALDI-TOF MS protocol in combination with PCR was successfully established to track an E. coli O157:H− strain in the rhizo- and phyllosphere. Thus, the association of the investigated strain to the phyllosphere of Batavia lettuce was elucidated. As salad is mainly consumed raw, this fact should be investigated further to increase consumer safety. AW planned the microbiological and molecular biological experiments and wrote the main part of the manuscript. SH performed the microbiological and molecular biological as well as greenhouse experiments and prepared the samples for MALDI-TOF MS measurement. RB and DD performed the MALDI-TOF MS measurements and the subsequent data analysis. HS provided knowledge on E. coli O157:H− 431/97 and significant input in the study design, and critically reviewed the manuscript. DD facilitated and supervised the greenhouse experiments and contributed in writing the manuscript. All authors read and approved the final manuscript. This work was part of COST (European Cooperation in Science and Technology) Action 1202 BacFoodNet (A European Network for Mitigating Bacterial Colonization and Persistence On Foods and Food Processing Environments) as well as Action CA16110 HUPLANTcontrol (Control of Human Pathogenic Micro-organisms in Plant Production Systems). 40538_2018_141_MOESM1_ESM.docx Additional file 1. Results of MALDI-TOF biotyping of potential E. coli O157:H− isolates. The nine first hits for the measured spectra of each of the 16 putative E. coli isolates in the MALDI-Biotyper 3.0 database are shown in tables S1 to S16. The main spectrum of the investigated strain was included in the database as Escherichia coli 431_97_drd. 40538_2018_141_MOESM2_ESM.xlsx Additional file 2. Peak lists and mass spectra of the MALDI-TOF MS analysis of the E. coli O157:H− strain 431/97 as well as all investigated isolates. 40538_2018_141_MOESM3_ESM.docx Additional file 3. Results of the partial amplification of the genes rfbE, sfpA and stx2a.